This operation, which stands out in the present financial environment, demonstrates the attractiveness of Solairedirect, its market and its business model. It strengthens the company’s position as France’s first pure play operator in solar power, a clean energy with enormous potential. Founded in 2006, Solairedirect is an integrated solar power provider, present on the photovoltaic value chain from module production to decentralized power network operation. The company develops and operates infrastructures of all sizes (rooftop and ground-mounted) with turnkey service offers (design and engineering, installation and construction, financing, operation and maintenance) as part of carbon footprint community projects. Solairedirect’s mission is to provide everyone with the choice of clean and home-based electricity, producing reliable, high performance, low-cost and smart solar kilowatt-hours. It systematically implements technology, manufacturing and service innovations with the stated intention to be among the first power producers to reach grid parity in France and other countries. The company has 150 employees, 1 500 residential and commercial customers and over 300 megawatts of solar parks under development. One of the very first solar parks in France (4.2 megawatts) is now being built in Vinon-sur-Verdon (Southeastern France) as a part of Solaire Durance, a joint venture between Solairedirect and Caisse des Dépôts, France’s largest government-owned financial institution. For Thierry Lepercq, CEO of Solairedirect, “ this round of financing sets off the second phase of Solairedirect’s development, with the national coverage of our residential and commercial service offers, the launch of our PV module production and the construction of our first large solar parks. It helps secure our growth objectives which will create hundreds of new jobs in 2009 “. The UK Government auctioned the first four million allowances to emit greenhouse gases under their portion of the European Union's Emissions Trading System this week, raising £54m ($80.9m). However, the government is drawing fire for failing to earmark the auction revenues to investments in clean energy and energy efficiency that could further cut emissions and help reduce the costs of compliance with the cap and trade program. Instead of reinvesting the revenues in clean energy ventures, the government is reportedly planning to add revenues to the general budget. "The first auction of carbon dioxide permits netted the government £54m ($80.9m) on Wednesday as bidders fought for the right to emit greenhouse gases. Almost 4m permits were sold in an auction that was four times over-subscribed. Previously, all of the emissions permits allocated to UK businesses under the European Union's trading scheme were given out free. The government has pledged to auction another 80m permits in the next four years, which is likely to bring in revenues of more than £1bn. The identities of bidders were not disclosed, but electricity producers were expected to be the main buyers as they had their free allocation of permits cut by 30 per cent. The free allocation of permits in the first phase of the scheme, from 2005 to 2008, enabled power companies in the UK and other countries to make windfall profits by raising electricity prices to cover the notional cost of having to buy permits, despite receiving them free. The government said on Wednesday the auctions should not result in further electricity price increases, as the cost of permits had already been factored in. The UK is pushing for power generators to have to pay for all of their carbon permits in the third phase of the EU scheme, from 2013, arguing that electricity producers tend to be well-insulated from international competition." "The UK government was under fire today for "undermining" the European Union's fight against climate change by auctioning off carbon allowances for the first time and not earmarking the cash for "green" projects. Around four million permits are being distributed today under a new phase of the European Union's (EU) emissions trading scheme (ETS) with expected receipts of up to £60m going to the Treasury for general spending purposes. "The policy of the UK government on this issue undermines the very purpose of the EU ETS... Auctioning undermines this flexible mechanism as it takes money away from those who can do something about climate change, the emitters, and it gives it to those who can't, the politicians," said James Emanuel at emissions trading broker, CantorCO2e. The Institute for Public Policy Research (IPPR) said ministers should change their mind and use the cash specifically for projects such as improving energy efficiency of homes, investing in low-carbon technologies and helping poorer countries cope with climate change. "This is a great opportunity to help poorer households make their homes both cheaper to heat and warmer, and create jobs through investment in new green technologies," said Lisa Harker, IPPR co-director. Keith Allott, head of climate change at WWF-UK, agreed saying the review by Lord Stern into the economics of climate change had shown that tackling the problem made sense financially. "This battle can't be won if we don't find the money to invest in solutions and kick-start new green industries," explained Allott." "The price of emission allowances have plunged by nearly 30% since September to around €16.50, partly because there are fears that the auction will flood the market and partly because a recession will cut industrial output and reduce pollution worldwide. The ETS scheme implements an overall cap on the amount of emissions countries can produce, allocates carbon allowances to companies and then allows them to buy or sell the permits to cover shortfalls or profit from cutting their emissions. Phase II of the scheme, which covers energy generators and heavy industry and aims to cut emissions by encouraging the market to produce carbon reductions at least cost, allows for up to 10% of permits to be auctioned. In the UK, 7%, or 85 million, permits are being auctioned over five years of the scheme to 2012. The main target of the auction is energy companies which have lost 30% of their free allowances." Today, five leading US companies joined Ceres investment group to launch a new coalition of corporate citizens calling on Congress to quickly enact strong U.S. climate and energy legislation that will spark a new clean energy economy and reduce global warming pollution. The new coalition issued several key principles for climate policy today, including proposals to stimulate renewable energy, promote energy efficiency and green jobs, cap global warming pollution and auction 100% of pollution allowances, and limit new coal-fired power plants to those that capture and store carbon emissions. The group, which includes Nike, Starbucks, Levi Strauss, Sun Microsystems and Timberland, calls themselves Business for Innovative Climate and Energy Policy, or BICEP for short, and aims to flex some lobbying muscle to support climate and clean energy action. Set greenhouse gas reduction targets to at least 25 percent below 1990 levels by 2020 and 80 percent below 1990 levels by 2050. Establish an economy-wide GHG cap-and-trade system that auctions 100 percent of carbon pollution allowances, promotes energy efficiency and accelerates clean energy technologies. Establish aggressive energy efficiency policies to achieve at least a doubling of our historic rate of energy efficiency improvement. Encourage transportation for a clean energy economy by promoting fuel-efficient vehicles, plug-in electric hybrids, low-carbon fuels, and transit-oriented development. Increase investment in energy efficiency, renewables and carbon capture and storage technologies while eliminating subsidies for fossil-fuel industries. Stimulate job growth through investment in climate-based solutions, especially “green-collar” jobs in low-income communities and others vulnerable to climate change’s economic impact. Adopt a national renewable portfolio standard requiring 20 percent of electricity to be generated from renewable energy sources by 2020, and 30 percent by 2030. Limit construction of new coal-fired power plants to those that capture and store carbon emissions, create incentives for carbon capture technology on new and existing plants, and phase out existing coal-based power plants that do not capture and store carbon by 2030. Recognizing that climate change will ripple across all sectors of the economy BICEP members aim to offer new business perspectives on climate solutions to balance the sometimes narrow viewpoints offered by some of the more engaged members of the business community. BICEP members also apparently recognize that being a good corporate citizen requires more than just purchasing carbon offsets and building more sustainable products. Like individual citizens, a real commitment to a new energy future requires more than personal actions, it requires active participation in the political process. “We can voluntarily change our own behavior in the hopes of mitigating impacts and are doing so," said Hilary Krane, senior vice president of corporate affairs at Levi Strauss & Co., "but we also believe that U.S. government leadership is essential if we are to create an environment in which every U.S. company recognizes the role it must play in addressing climate change." "Nike understands the value of investing in innovative solutions to address the challenges of sustainability," added Sarah Severn a corporate responsibility director with the company, "so we are proud to be part of a coalition of companies that believes legislative action on climate change and clean energy is not only urgent but imperative to creating positive, long-term change." As a native Oregonian, I can't help but contrast Beaverton, OR-based Nike's active commitment to good corporate citizenship with Oregon's other major employer: Intel. The microprocessor giant is Oregon's largest private employer, and while it launches ads touting their efficient processor designs and issues press releases about renewable energy purchases, Intel quietly lobbies to block progressive energy and climate policy at the Oregon legislature. Intel is a key member of the Industrial Customers of Northwest Utilities group, a state lobbying organization that represents large electricity and natural gas users in Oregon and Washington. ICNU has consistently been on the wrong side of good energy policy - from the Oregon Renewable Energy Act of 2007 to the state's efforts to lead on climate policy - and is now forming a front-group called something like Oregon Industries for Balanced Climate Policy, gearing up to block progressive legislation in the 2009 Oregon legislature. Unlike Nike, who puts it's lobbying muscle behind it's clean energy commitments, Intel tacitly and at times actively supports ICNU's efforts to stand in the way of Oregon's transformation into a clean energy leader. Intel should take queues from fellow Oregonians, Nike, and their semiconductor competitors at Sun about what good corporate citizenship means, and actively distance itself from ICNU's dirty deeds. Until then, bravo to Nike and the BICEP members for leading the way. In a prepared video address delivered today at the Global Climate Summit in Los Angeles, CA, President-elect Barack Obama pledged to turn over "a new chapter in America's leadership on climate change." In the short address, viewed by an audience that includes leaders from around the nation and the world, Obama emphasized the importance of the upcoming international climate negotiations in Poznan, Poland, and said he was "looking forward to working with all nations to meet [the climate] challenge in the coming years." Obama reconfirmed his campaign commitments to reduce greenhouse gas emissions 80% by 2050 through a national cap and trade program and again pledged to "invest $15 billion each year to catalyze private sector efforts to build a clean energy future." "Few challenges facing America -- and the world -- are more urgent than combating climate change. Many of you are working to confront this challenge....but too often, Washington has failed to show the same kind of leadership. That will change when I take office." Few challenges facing America – and the world – are more urgent than combating climate change. The science is beyond dispute and the facts are clear. Sea levels are rising. Coastlines are shrinking. We've seen record drought, spreading famine, and storms that are growing stronger with each passing hurricane season. I know many of you are working to confront this challenge. In particular, I want to commend Governor Sebelius, Governor Doyle, Governor Crist, Governor Blagojevich and your host, Governor Schwarzenegger –all of you have shown true leadership in the fight to combat global warming. And we've also seen a number of businesses doing their part by investing in clean energy technologies. But too often, Washington has failed to show the same kind of leadership. That will change when I take office. My presidency will mark a new chapter in America's leadership on climate change that will strengthen our security and create millions of new jobs in the process. Further, we will invest $15 billion each year to catalyze private sector efforts to build a clean energy future. We will invest in solar power, wind power, and next generation biofuels. We will tap nuclear power, while making sure it's safe. And we will develop clean coal technologies. This investment will not only help us reduce our dependence on foreign oil, making the United States more secure. And it will not only help us bring about a clean energy future, saving our planet. It will also help us transform our industries and steer our country out of this economic crisis by generating five million new green jobs that pay well and can't be outsourced. Let me also say a special word to the delegates from around the world who will gather at Poland next month: your work is vital to the planet. While I won't be President at the time of your meeting and while the United States has only one President at a time, I've asked Members of Congress who are attending the conference as observers to report back to me on what they learn there. Stopping climate change won't be easy. It won't happen overnight. But I promise you this: When I am President, any governor who's willing to promote clean energy will have a partner in the White House. Any company that's willing to invest in clean energy will have an ally in Washington. And any nation that's willing to join the cause of combating climate change will have an ally in the United States of America. Thank you. BREAKING NEWS: The Sierra Club just won a HUGE legal victory in a coal permitting case at the Environmental Protection Agency's Environmental Appeals Board. The ruling in the Bonanza coal plant permitting case (pdf) ruled with the Club's lawyers that since the Mass. v EPA Supreme Court ruling said Carbon Dioxide is a pollutant under the Clean Air Act, new coal-fired power plants must implement "Best Available Control Technology" (BACT for short) for CO2. While the Sierra Club's legal team and other lawyers are still determining the full implications of the decision, it appears that this decision will essentially stop all new coal plant permitting dead in it's tracks for at least a year as EPA decides what BACT means in the context of CO2. The BACT provision of the Clean Air Act requires that new power plants must employ the most effective, readily available pollution control technologies for regulated pollutants in order to receive air quality permits required for development, ensuring that new power plants are progressively cleaner as new technologies become readily available. Until this ruling, BACT has only applied to NOx, acid rain-forming SO2, particulate matter, mercury and other noxious pollutants, but not carbon dioxide, which spewed freely from permitted power plants. What BACT means for CO2 is therefore undefined, and the process of defining it will take time - time during which no new coal plants can receive permits. BACT for CO2 is unlikely to mean carbon capture and storage (yet), since it's not readily available, but it will probably mean some combination of co-generation (making use of waste heat from electricity generation), efficiency improvements, and/or fuel switching/co-firing with biomass. Ultimately, President-elect Obama's EPA gets to decide how BACT is defined for CO2, a process which will take at least a year. In the meantime, 30 permits for new coal-fired power plants in the seven state directly regulated by the EPA's permitting process, plus projects on all Indian Reservations will immediately die because of this ruling. Other states that do their own permitting under devolution of authority from EPA will have to start their permitting processes over from scratch. They can either decide on a case by case basis what BACT means for CO2, or they can wait for EPA to rule on nationwide basis. The Environmental Appeals Board ruling says that decision is best made on a national basis. In short, with this new regulatory uncertainty, it's highly unlikely anyone will want to invest a dime in a new coal plant for the foreseeable future. Of course, this will also leave President Obama with an interesting ruling to make with some real political ramifications. But I'd say Obama has plenty of cover since the coal industry has been so avidly touting how clean it is these days. The real bold move would be to require all new coal plants to meet an emissions performance standard that essentially means they'd have to sequester at least half their emissions (as in CA or WA state's emissions performance standards), put an end to mountain top removal coal mining, and really tell the coal industry, "it's time to put up or shut up" and make this "clean coal" thing they keep talking about a reality. The Club will have a press release out later today, and I'd refer you to the Warming Law blog for more detailed legal analysis no doubt coming soon. This was an unexpected ruling, so they're still sorting out all the ramifications. This is the second post in a continuing series delving into Barack Obama's opportunity to capture this political moment and provide a direction for energy policy and economic growth in the 21st century. Part 1 is here. As Barack Obama assumes the mantle of President-elect of the United States of America, we are witnessing an historic realignment of the American political landscape. With the election of our nation's first African-American president, record voter turnout, and a dramatically redrawn electoral map, it seems that anything is possible now. However, while Obama clearly has a new mandate to lead our nation, electoral mandates are fickle and even this one could fade in time. President-elect Obama has just 76 days to prepare for his inauguration. Then the real work of governing will begin, and what Obama decides to do in his first 100 days will either cement or erase the wave of popular support the President-elect rides today. His job won't be easy. On January 20th, President-elect Obama will inherit the White House along with a plethora of pressing challenges all competing for his attention. There will be no time for baby steps, and President Obama must show bold and effective leadership right out of the gate. Furthermore, while the economic crisis will remain his top concern in the short-run, Obama cannot afford to ignore longer-term challenges and must develop synergistic solutions that can tackle multiple problems at once. Thankfully, Barack Obama has stated that building a new energy economy will be his top priority upon assuming office. If he fully integrates this effort with his shorter-term economic stimulus plans, Obama could effectively tackle several priorities - economy recovery, energy security, and global warming - simultaneously. And getting this job done right could cement Obama's electoral mandate and pave the way for a truly transcendent presidency. With the all the frantic focus on economic stimulus these days, it's easy to forget that Obama really faces two economic challenges. Yes, we need quick, effective, short term stimulus to pull our nation out of recession. But we also face a longer run economic revitalization challenge that is critical to ensuring our nation's prolonged prosperity. For too long, we have neglected to invest in our nation. We've let or infrastructure crumble, our schools and universities want for funding, and we've neglected the once-solid pipelines of technological innovation that made us the envy of the world. Blinded by an era of cheap credit and unrestrained consumer spending and bound by a dominant and dogmatic market fundamentalist philosophy of governance, we've seen the light go out of our once vibrant economy. Rekindling the flame of American prosperity will no doubt be the defining task of the Obama administration. Obama has already made it clear that he believes a new energy economy will be America's next engine of growth. That's smart. There are few (if any) other major growth sectors waiting to be spurred, and building a new energy economy knits together his central economic challenges with other national priorities. And if Obama makes the right decisions in the coming months, his short-term stimulus agenda can be an effective bridge to the longer-term investments necessary to build a new energy economy and secure prolonged American prosperity. DON'T be afraid of deficit spending. Obama should ignore the counsel he will no doubt receive from deficit hawks and Clinton-era small-government Democrats to avoid deficit spending and stick to pay-go. And he should not listen if Greens council him to use a full-on cap and trade program to fund all of the spending for his new energy economy agenda. As the spender and lender of last resort during times of economic crisis, reining in government spending would be just as bad for the economy as raising taxes. The fact is, deficit spending is necessary for effective stimulus and it's smart for longer-term investments that will net returns for the U.S. Treasury. And with so much demand for U.S. Treasury Bonds, yields on two-year bonds are just 1.3%. After factoring in inflation, that means the government can borrow money essentially for free. All this means that President Obama shouldn't be afraid to borrow and invest if it helps get our nation out of today's recession and lay the groundwork for a new energy economy. DON'T focus on short-term stimulus only. That being said, Obama also cannot afford a myopic focus on stimulus alone or rely solely (or even at all) on cash rebate checks. While quick-acting, cash rebate checks are not a particularly effective form of stimulus. In fact, initial studies find considerable evidence that most of the 2008 stimulus checks were put into savings or used to pay down debt. Furthermore, when they do work, rebate checks significantly under-perform investments in infrastructure and direct aid to state governments. Perhaps most importantly, if Obama relies on rebate checks to stimulate the economy, he will miss the golden opportunity to make his stimulus investments a bridge to longer-term priorities, like sparking a new energy economy. Given the many challenges he faces as president, Obama cannot afford to miss that opportunity. DON'T propose policies that raise energy bills. While a carbon price would be an important accelerator of clean energy investment and innovation, offering policies that raise energy prices at a time of economic insecurity is a risky political venture (to say the least). Instead, Obama should make the development of clean, affordable energy sources the explicit focus of his policies. To the degree that carbon pricing plays a role in his new energy agenda, President Obama must be clear that the revenue raised will be directly invested in programs that reduce the cost of clean energy alternatives and in energy efficiency programs that will slash the energy bills of households and businesses. DON'T promise short-term fixes to high gas prices. There simply aren't any, and Obama would be smart to use his new bully pulpit and impressive communication skills to make that fact clear to the American public. The false promise of "Drill Baby, Drill!" is a disingenuous myth that President Obama should put to rest for good. Oil prices are set in a global commodity market, and the United States simply lacks sizable enough domestic production capacity to have a significant moderating effect on oil prices. If we want to moderate oil prices, we can't do it with a focus on the supply side of the equation, a fact Obama has correctly emphasized by repeatedly saying, "We can't drill our way out of our energy crisis." If we want to expand domestic oil production, it shouldn't be motivated by false promises of lower gas prices. To the extent that we do expand drilling operations, it should be to raise revenues for public investment in a new energy economy, or to (modestly) enhance our trade deficit. Obama also should make good on his promise to speak openly and honestly to the American people about the challenges we face: the American public needs to hear their President say that while gas and oil prices are low today, they will not remain so for long. According to the International Energy Agency, oil prices will rebound to well above $100 per barrel as soon as the global economy recovers, adding dead-weight just as our economy struggles to stand again. That means that today's temporary relief from $4.00/gallon gas is exactly the time to invest in new, affordable alternatives and efforts to sever our dependence on oil. If he's clear and honest about the challenge of oil dependency, Obama will have further reason to invest in a new energy economy and launch the critical, long-term effort to electrify transportation and create the clean, cheap energy sources we need. If implemented, this strategy will finally free our nation from the volatility of oil prices and the havoc gas price spikes wreck on our economy. DON'T: separate out his clean energy and economic agendas. For too long, clean energy policy was the domain of a relatively isolated environmentalist agenda. Despite it's widespread impacts on issues of national security, economic prosperity and public health, clean energy failed to take it's rightful place as a core progressive issue. Now, Obama has successfully transformed clean energy into a bread and butter economic issue. During the closing weeks of the campaign, Obama's clean energy agenda became fully intertwined with his economic recovery plans, and that's exactly where it should stay. A clean energy program will be most effective when fully integrated with the President-elect's economic recovery plans and it should remain a core component of his vision for renewed, long-term prosperity. Clean energy is an economic not environmental issue now, and that's exactly right. In Part 3 of this ongoing series, we will outline several principles for smart investments in our nation's recovery and the birth of a new energy economy. Energy policy has never featured more prominently in a presidential election. Both candidates leaned strongly on their energy agendas during the campaign, frequently highlighting their plans to increase America's energy security, reduce energy prices and create jobs. But while both candidates agreed that energy was a high priority and rhetorically supported an "all of the above" approach to new energy sources, the two candidates proposals actually differed sharply. 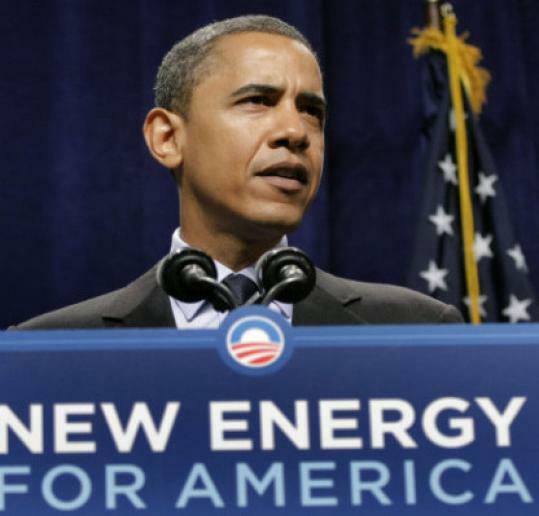 Furthermore, Barack Obama enjoyed the most success when his energy proposals were linked to his plans for economic recovery and couched in the rhetoric of job creation. That makes Obama's historic victory a clear endorsement of the President-elect's plans to invest in a new energy economy and argues for further integration of his energy plans into his economic recovery agenda. While he claimed to support an "all of the above" energy plan, John McCain's energy platform revolved around increasing domestic production of oil and nuclear power. McCain repeatedly touted nuclear power as his favorite (if not only) answer to our nation's energy challenge, and "Drill Baby, Drill!" practically became the all-encompassing mantra of the Republican party and it's presidential nominee. McCain's repeated absence from key clean energy votes in the Senate and the selection of Sarah Palin as his running mate and supposed energy czar was the final proof that a McCain-Palin administration would focus centrally on expanding the old energy sources of the 19th and 20th century - oil and nuclear power - rather than the new energy sources of the future. In contrast, while Barack Obama eventually embraced expanded drilling, he truthfully told the American people that "we can't drill our way out of our energy crisis." Similarly, he voiced conditional support for nuclear power, but made it clear that unresolved issues with nuclear waste and security needed to be addressed before nukes could play a central role in America's energy future. Instead, Obama called for the creation of a comprehensive new energy economy, with a central focus on increasing vehicle fuel efficiency, electrifying transportation, expanding renewable energy production and retrofitting millions of homes and businesses to be more energy efficient. He considers this effort a new "national project" and promised to fund it to the tune of at least $150 billion over ten years. Interestingly, Obama didn't really find his voice on energy policy until the economic crisis hit, unseating energy as the top campaign issue. Back in September, when energy prices were the top election issue and Americans were shouting for quick fixes, Obama fumbled for an adequate response. In many ways, this was understandable, since there really are no quick fixes for high gas prices (that is, unless you consider the Bush energy plan - crashing the global economy! - to be a viable solution). So while Obama had long-ago outlined a detailed and comprehensive energy plan that would spur the creation of clean and affordable new sources of energy in the long-term, he must have felt that telling the American people there was no short-term answer was a dangerous move. It certainly wasn't what Americans wanted to hear, but by remaining largely silent, Obama quickly found himself in the darkest days of the campaign. Republicans had no qualms about proposing disingenuous solutions to spiking prices at the pump and quickly rallied around "Drill, Baby Drill!" It worked. McCain surged, taking the lead in the polls, and for the first half of September, it looked like Obama was headed towards defeat. Then the economic crisis hit in all it's fury, and everything changed. The threat of global recession caused oil prices to fall almost as quickly as the Dow, and fears of another Great Depression displaced nearly every other concern. That's when Obama realized that he was holding an ace up his sleeve: his energy plan. In the closing weeks of the campaign, Obama hit his stride and brought his energy plan front and center. He touted opportunities to strengthen the American auto industry, bring manufacturing jobs back to American towns and save energy and money while creating new jobs in the energy efficiency sector. And in speech after speech, whenever he mentioned economic recovery and job creation, he talked about investments in clean energy and energy efficiency. As he outlined his economic recovery plan on October 13th, Obama reiterated his pledge to "create 5 million new, high-wage jobs by investing in ... renewable sources of energy." He included funding for "energy efficient school and infrastructure repairs" in his Jobs and Growth Fund proposal and called on Congress to fast track "$50 billion in loan guarantees to help the auto industry retool, develop new battery technologies and produce the next generation of fuel efficient cars here in America." In an October 22nd interview with Time magazine's Joe Klien, Obama clearly stated, "[Building a new energy economy] is going to be my No. 1 priority when I get into office," saying, "there is no better potential driver that pervades all aspects of our economy than a new energy economy." A week later, Obama aired his thirty-minute October 29th TV special, "American Voices, American Stories." In it, he highlighted Seattle-based energy efficiency specialists, McKinstry Company as "a model for the nation," and again pledged to "invest $15 billion a year in energy efficiency and renewable sources of energy, like wind, solar, and biofuels, creating five million clean energy jobs over the next decade -- jobs that pay well and can never be outsourced." In versions of his "closing argument" speech delivered across swing states in the final week of the election, Obama called for the creation of "an economy that rewards work and creates prosperity from the bottom up," exhorting America to "invest in... renewable energy for our future." Finally, in his victory speech last night, he reiterated this theme, saying, "There is new energy to harness and new jobs to be created!" History will record energy and the economy as the top issues of the 2008 presidential campaign. In the face of the mounting financial crisis, Barack Obama's calm assurance was the leadership the electorate was looking for. And as he successfuly united his clean energy and economic recovery proposals, Obama provided the vision of renewed prosperity Americans were hungry for. Obama's landslide victory carries with it a clear mandate to build the new energy economy he so frequently spoke of. But he should be clear-eyed that this mandate derives from the economic crisis and continue to pursue his energy agenda hand-in-hand with his economic recovery plans. With so many pressing concerns facing our nation, there will be little time for Obama to tackle issues one at a time. Instead, our nation's 44th President must find innovative and synergistic solutions that can address several priorities at once. We will see his abilities quickly tested. Even before Inauguration Day, Obama will be counted on to offer an economic stimulus agenda, and he'll be expected to act upon his self-selected No. 1 priority, - building a new energy economy - immediately upon assuming office. In fact, the fate of the Obama presidency may very well hang on his performance on this critical first test. In Part 2 of this series, we will focus on how President-elect Barack Obama can get the job done right and advance an integrated clean energy and economic recovery agenda in his first 100 Days in office. Representative Henry Waxman (D-CA) plans to challenge venerable Representative John Dingell (D-MI) for chairmanship of the influential House Energy and Commerce Committee, according to a report from Roll Call. "The move marks a major showdown between two Democratic powerhouses, with implications for a host of major legislation next year from health care to global warming to renewable energy. Waxman currently chairs the Oversight and Government Reform panel." The House Energy and Commerce Committee has jurisdiction over a wide range of critical issues, including energy policy, health care, interstate commerce issues and most likely global warming policy as well. The committee will no doubt be a critical player in the legislative implementation of President-elect Obama's policy agenda. Waxman and Dingell have taken two dramatically different stances on global warming and energy during the 110th Congress and a change in chairmanship could reshape the Congressional political landscape on these issues. Reflecting their differing constituencies, Dingell opposed California (and 15 other states') efforts to set tailpipe emissions standards for greenhouse gases while Waxman led hearings to press EPA Administrator Stephen Johnson on why the agency had blocked California's efforts. The difference is just as clear when it comes to federal climate policy. In March 2007, Waxman introduced the Safe Climate Act, still the most aggressive proposal for global warming pollution caps in the Congress. In contrast, Dingell and his committee waited until the final hours of the 110th Congress to release a draft outline for economy-wide greenhouse gas regulations. Roll Call reports that a number of other key House leadership races were also underway, less than 24 hours after the polls closed. The Prime Minister has today announced a long-term strategic partnership between Qatar and the UK as part of the UK Government's commitment to forge new partnerships between hydrocarbon producing countries and consumer countries to help the move to a low carbon economy. The Carbon Trust - set up by the UK Government in 2001 and one of the world’s leading experts on low carbon technologies - has signed a Memorandum of Understanding with the Qatar Investment Authority (QIA) on a new Low Carbon Innovation Partnership to set up a new £250m Qatar-UK Clean Technology Investment Fund and to investigate the creation of a Low Carbon Innovation Centre in Qatar. The Fund will seek to make venture capital investments in clean energy businesses primarily located in the UK. Selected investment opportunities in continental Europe will also be considered. In addition, the Fund will consider investing in the Gulf Region once an investment capability is established in Qatar. The Fund will begin investing with up to £150m committed from the QIA alongside the Carbon Trust’s commitment. It will look for further funding from other investors to bring the maximum amount to £250m. The Memorandum of Understanding also includes a commitment to carry out a feasibility study to investigate the creation of a Low Carbon Innovation Centre in Qatar. It will aim to share skills and knowledge on the development, commercialisation and deployment of low carbon technology between the UK and Qatar. The implementation of an European Energy Research Alliance was recently defended in Bruxels, a measure that is intended to boost up new technologies and favour the use of clean energy in the European Union (EU). The measure was proposed by the European Commission and is seen by entities as a «determining factor» in the sense that it may improve the growth of new technologies which may distinguish themselves by producing low carbon emissions and help increasing the scale of the clean energy tech market. The main EU research institutes will be responsible for the alliance, which is based on the idea of «amplifying and improving the means» dedicated to the investigation of the energetic sector. This alliance was created on the framework of the Set-Plan, a model intended to promote the development of renewable energy and reduce, on the long-term, the EU dependence on fossil fuel imports. CO2 storage, bio, solar and wind energy, sustainable fusion and intelligent electric supply are amongst the processes intended to be improved through the creation of this plan.